If you’re looking for the ultimate, elegant comfort food recipe for your next cold-weather dinner party, this is it. Short ribs Bordelaise — or Bourguignon if you use wine from the Burgandy region versus Bordeaux — never fail to impress. I mean really, meltingly tender beef covered in a rich, reduced wine sauce — what’s not to love? Plus, the bulk of the work — braising, the worst-offending dirty dishes (admittedly, this recipe makes a lot), veggie prep — can be done a day or so ahead of time; this means that any worry that the meat will still be tough and veggies overcooked with the kitchen a total mess by dinnertime goes out the window! While totally worth it, the biggest downside to this recipe is the cost; at about eight bucks a pound, the bill for the short ribs really adds up when we’re talking three to four pounds of meat. (Over six folks, that’s not so bad per plate, but still. Ouch.) That’s why I set aside every. last. drop. of reduced sauce that’s leftover (usually at least a cup) and useable of meat that I’ve trimmed from the ribs just before serving — all of that is transformed into a ridiculously elegant poutine at a later date so nothing goes to waste! Arrange/remove oven racks so a 6-quart Dutch oven can be centered vertically. Preheat to 250°F. In a medium saucepan (4-quart) over medium-low heat, warm 1 tablespoon of the olive oil until shimmering. Add shallot, sauté until browned in spots (about 2 minutes). Add carrots, cook, stirring occasionally, until browned in spots (about 4 – 5 minutes). Stir in garlic, cook for about 15 seconds just to mellow the flavor slightly without browning. Deglaze pan with beef broth, and stir in tomato, thyme and bay leaf; bring to a boil over high heat. Continue to boil until reduced by about half (about 20 minutes). Discard bay leaf. Use an immersion blender (or transfer to blender or food processor, but do not cover the top completely unless you want an explosion to occur — I just hold several layers of floursack towel over the small, center hole) and process until smooth, you’ll have about 4 cups (if needed, add water to make 4 cups). Set aside. Place 6-quart Dutch oven over high heat, warm remaining tablespoon olive oil just until it begins to smoke. Season short ribs with salt and pepper, sear on three sides (I skip the bone side and two short ends) for about 30 seconds – 1 minute each, just until browned slightly. Remove pan from heat, and transfer seared ribs to a large, heatproof plate. Carefully deglaze pan (it’ll steam!) with about 1/2 cup wine. Stir in remaining wine and pureed veggie mixture. Add short ribs (arrange bone side down) and any accumulated juices to the pot. Cover and place in the preheated oven; braise for about 4 hours or until meat is very tender. Once short ribs are tender, remove them from the braising liquid — a pair of tongs is helpful here! — to a large, ovenproof dish or platter. Cover with aluminum foil and place in the still warm-but-turned-off oven; once you begin cooking vegetables, turn oven to warm, about 170°. Place a fine mesh sieve over a small pot (2-quart) and press braising liquid through with the assistance of a spatula to remove solids; discard solids. Bring to a steady simmer over medium heat, cover with a splatter screen (if desired), and cook, stirring occasionally, until sauce is thickened and reduced to about 3 cups (about 30 minutes); season to taste with salt and pepper, keep warm. DO AHEAD: Short ribs can be braised and sauce reduced several days before serving. Instead of placing dish of short ribs in oven to keep warm, cool them to room temperature then cover and refrigerate. Transfer reduced sauce to a separate dish. To reheat, preheat oven to 250°F. Spread a thin layer of reduced sauce over the bottom of the Dutch Oven. Arrange short ribs bone side down and spoon a small amount of sauce over each. Place in preheated oven and warm for about 1 hour before cooking the vegetables (outlined below) and reheating remaining reduced sauce in a small saucepan. Once braising liquid is reduced, cook carrots and mushrooms. Bring water to a boil in a large pot fitted with steamer basket. Add carrots, cover, and steam for about 10 minutes or until tender. While water comes to a boil, set a 10″ cast iron skillet (or 4-quart sauté pan) over low heat. Add pancetta and cook, stirring occasionally, until crisp. Remove pancetta to a paper towel-lined plate using a slotted spoon (you’ll use the rendered fat along with some oil to cook the mushrooms). Increase heat to medium-high and warm 1 tablespoon of the olive oil until shimmering; add half of the mushrooms, tossing quickly to coat with oil. Cook, stirring only once or twice, until deep golden brown (about 2 minutes total). Transfer to heatproof plate; set aside. Repeat with remaining tablespoon olive oil and other half of the mushrooms. To serve, I like to remove the short ribs from the bone, trimming meat to make a nice, neat serving (reserve trimmings and any meat clinging to bones for poutine (recipe coming soon)!). 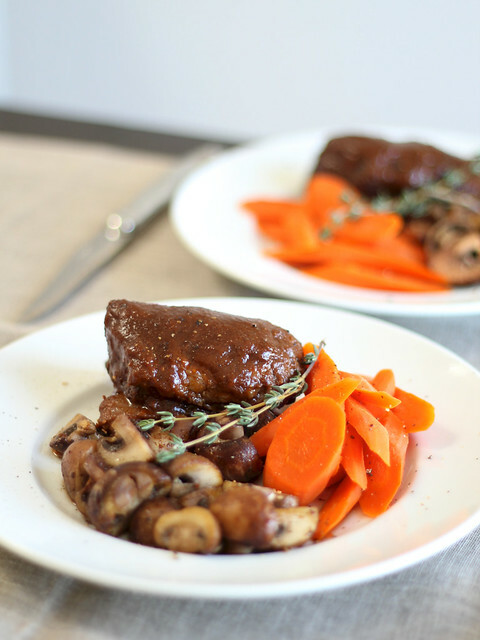 Serve 1 – 11⁄2 short ribs per person and divide carrots and mushrooms amongst plates; sprinkle pancetta over mushrooms and, if desired, arrange a sprig of thyme on top. Serve immediately with additional reduced sauce on the side.